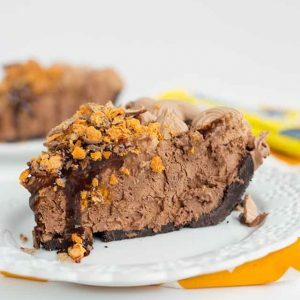 This BUTTERFINGER® Ice Cream Pie has an easy homemade chocolate ice cream that does not require an ice cream maker. 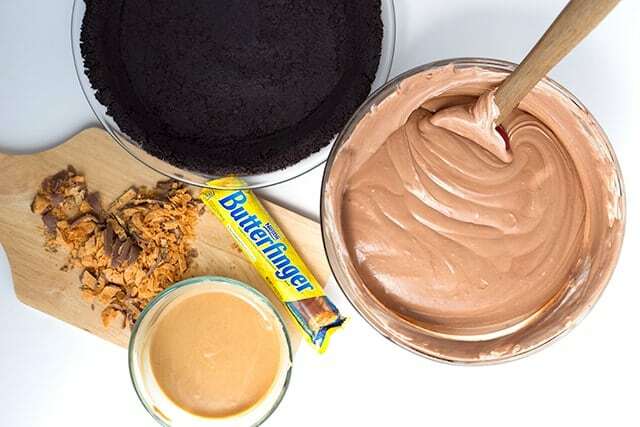 There are bits of BUTTERFINGER® Bars chopped up in it, swirls of peanut butter and chocolate syrup, and topped with a chocolate whipped cream! It’s the perfect summer treat and is so simple to put together! 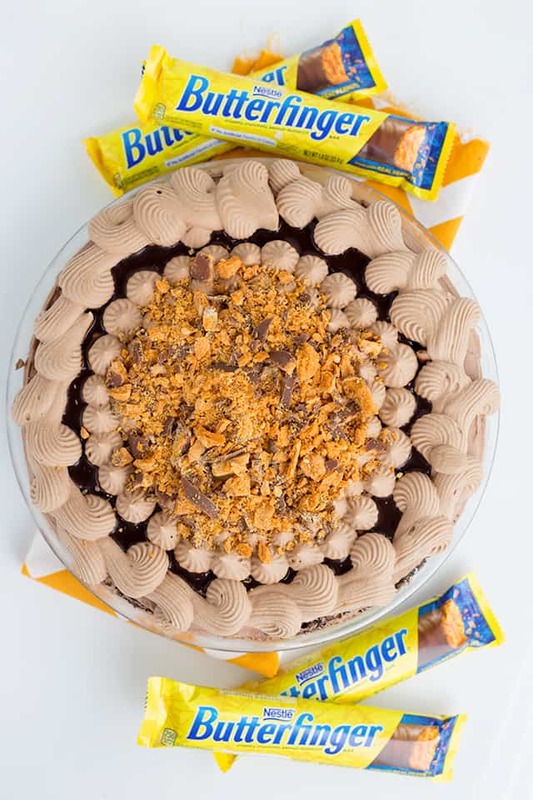 It’s hard to believe that this BUTTERFINGER® Ice Cream Pie can be made in 5 easy steps, isn’t it? BUTTERFINGER® bars are one of my very favorite candy bars. Their taste has the perfect crispety, crunchety, peanut-buttery flavor. They even smell amazing! They also make the perfect addition to any dessert recipe. 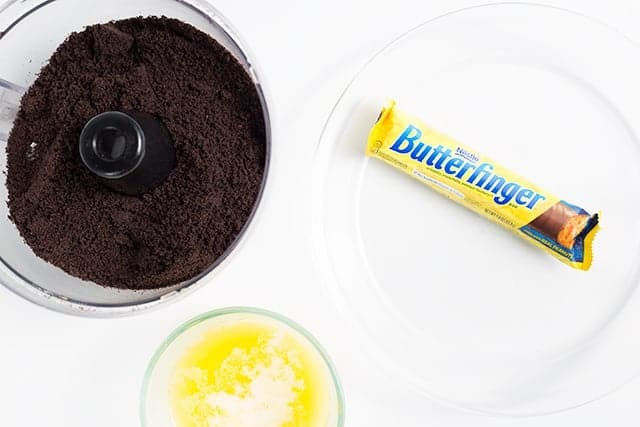 Did I mention that you can take a traditional recipe and put a fun spin on it with a BUTTERFINGER® Bar? You totally can. I’ve noticed a lot of ice cream cakes and pies use store-bought ice cream, so I thought why not switch it up?! Let’s get a little adventurous with our pie making today and make our own ice cream. I need it to be quick AND easy for everyone to make without having special tools, meaning an ice cream maker. I whipped up a no-churn chocolate ice cream to stuff inside that chocolate cookie pie crust. This chocolate cookie crust doesn’t need to be baked. I added a little extra butter to help glue everything together. I use chocolate sandwich cookies and grind them up into crumbs using a food processor. You can also use a large storage bag and a rolling pin. It will take a little more time, but does the same job. Add the cookie crumbs and butter together. It will look like a wet sand. Press it firmly into a 9 1/2 inch pie plate. Pop into the fridge until the ice cream is made. No churn chocolate ice cream is quick and easy to make. It doesn’t require an ice cream machine. The 3 main ingredients for this ice cream are whipped cream, sweetened condensed milk, and cocoa powder. You can work in special little add-ins like bits of chopped up BUTTERFINGER® Bars. I added some melted milk chocolate chips to my ice cream. I LOVE milk chocolate chips so I add them to most everything I intend on having chocolate in. I also feel like once the chocolate is chilled and able to set up, it will give the ice cream a little more stability. Stability is a good thing since whipped cream and whipped cream-based recipes aren’t really known for being long lasting desserts. They can separate and become a melty mess. To get the melted chocolate added to the cocoa powder and condensed milk, I stir the cocoa powder and sweetened condensed milk together until combined. Then, add the milk chocolate chips and microwave for 30 seconds and stir. If the mixture isn’t smooth, microwave for another 30 seconds. 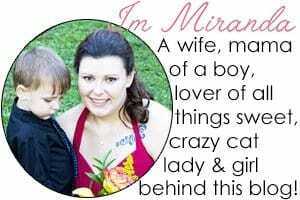 Here’s the important part. Let the mixture cool! Stir it often while it’s cooling to prevent a chocolate crust from forming. That will leave your mixture slightly lumpy. Then fold that into your whipped cream and add in some chunks of BUTTERFINGER® Bars. 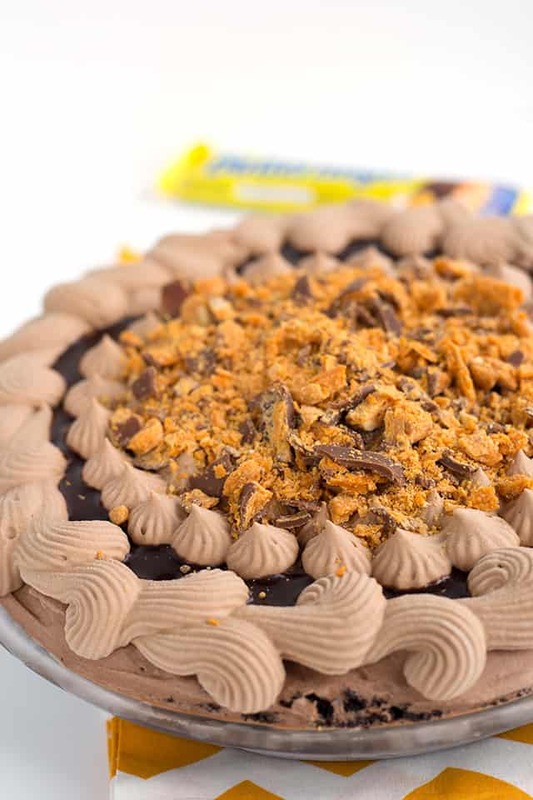 For the BUTTERFINGER® Ice Cream Pie, I wanted to have surprises throughout the pie. 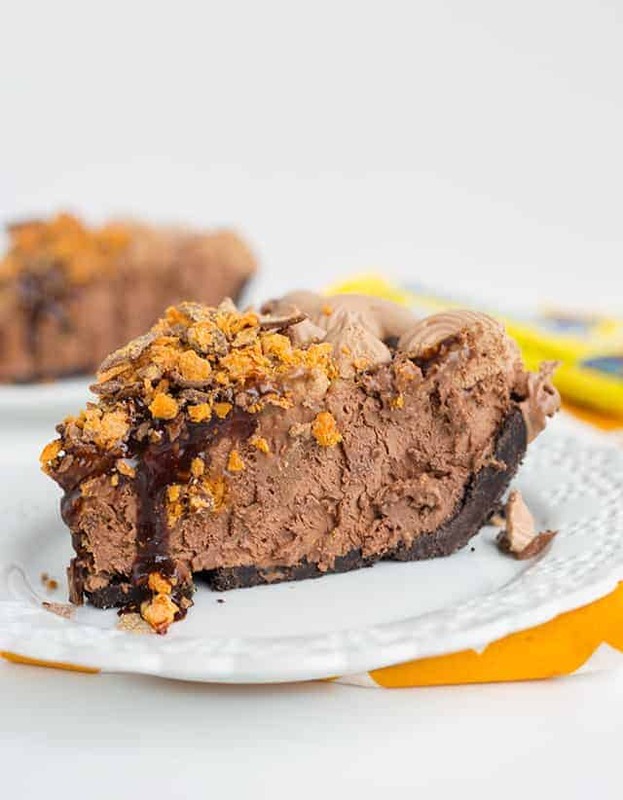 So, chunks of BUTTERFINGER® Bars are folded in and swirls of peanut butter and chocolate syrup are added into the pie. It only takes a minute to do which is really nice. Sometimes, if I feel that something seems incredibly difficult, I’m known to skip over it unless it’s a recipe for my site. Here’s everything laid out for you. 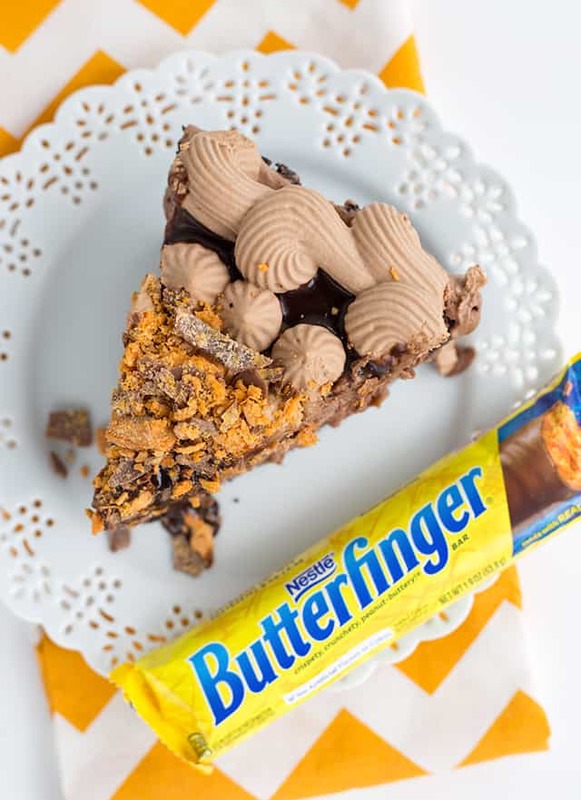 You can either fold in the BUTTERFINGER® Bars bits into the ice cream before adding it into the pie plate or after. I recommend before but it’s up to you. Pour the ice cream into the pie plate. Don’t overfill the crust because the ice cream will spread and make a huge mess especially while you’re mixing in the add-ins. Drizzle melted peanut butter and chocolate syrup on top and using a knife, skewer, or toothpick to swirl it around. You can also add the melted peanut butter into a sandwich bag and pop the tip of the sandwich bag in the ice cream and add pockets of peanut butter. This is the perfect recipe to just take a minute and enjoy life with. It’s easy to make and waiting in the freezer for that moment when you need it. 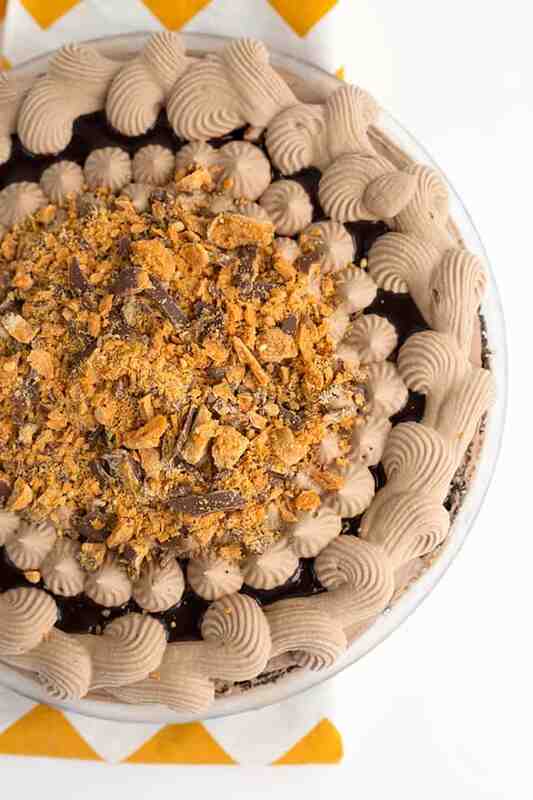 It will cool you down on a hot day, cure a chocolate craving, and make every BUTTERFINGER® lover’s heart race. The candy keeps the crispety, crunchety, peanut-buttery flavor, the peanut butter firms up, and the chocolate syrup drips out. Can’t get enough? 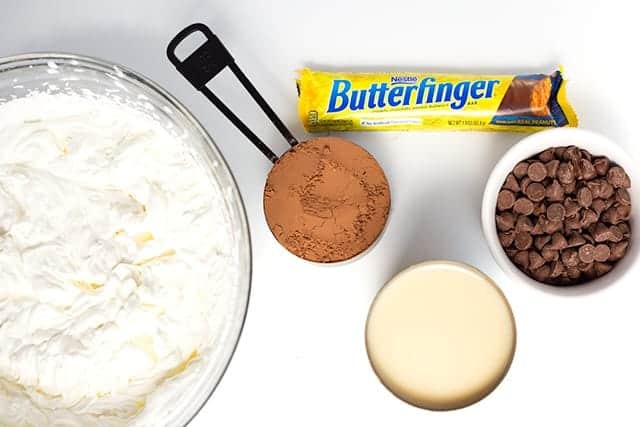 I also have an amazing recipe for easy no-bake BUTTERFINGER® bites! They are incredibly addicting. In a medium bowl, add in the chocolate cookie crumbs and butter. Stir until it looks like wet sand. Firmly press into a 9 1/2 inch pie plate. Place into the fridge while working on the ice cream. In a medium microwave-safe bowl, add the sweetened condensed milk and cocoa powder. Stir until combined. Add in the chocolate chips and place in the microwave for 30 seconds. Stir until the mixture is smooth. If there are still lumps, microwave for an additional 30 seconds and stir. Let cool to room temperature and stir the mixture often to avoid the chocolate forming a crust on top while it's cooling. Fold about 1/2 cup of whipped cream into the cooled chocolate. This will lighten the chocolate mixture. Pour the chocolate into the whipped cream and fold until incorporated. Fold in the chopped Butterfinger. Pour into the prepared cookie crust. Drizzle chocolate syrup and peanut butter on top of the ice cream pie and swirl in with a knife or skewer. Place in the freezer to chill until firm. This will take about an hour. For the chocolate whipped cream, add the chocolate and 2 tablespoons of whipped cream into a microwave-safe bowl. Microwave for 30 seconds and stir. Repeat if the chocolate isn't completely melted. Let cool to room temperature. Add about 1/2 cup of whipped cream into the cooled chocolate mixture and stir. Pour the chocolate mixture into the whipped cream and fold until incorporated. Place into a piping bag fitted with a 4B tip and pipe shells and stars on the pie. Add chocolate syrup and the chopped Butterfinger to the center. Freeze overnight until firm. Cut and serve! This recipe seems quite involved, but the finished ice cream looks and sounds soooooo amazing. Pinning because I seriously can’t wait to try. Have to unload the three tubs of ice cream in my freezer first… Don’t judge, hehe. I recently started a new link up on my EyeLoveKnots blog, and would love if you came to link up! This month, I am sponsoring the giveaway of a pair of peacock earrings! You had me at Butterfinger – my favorite candy bar! YUM!!! Thanks for sharing at our Merry Monday party – I’ll be featuring your ice cream pie at our upcoming party!